The Green Lanterns (Jessica Cruz, Simon Baz) unknowingly encounter a life-form, and return with it back to the Justice League watchtower. 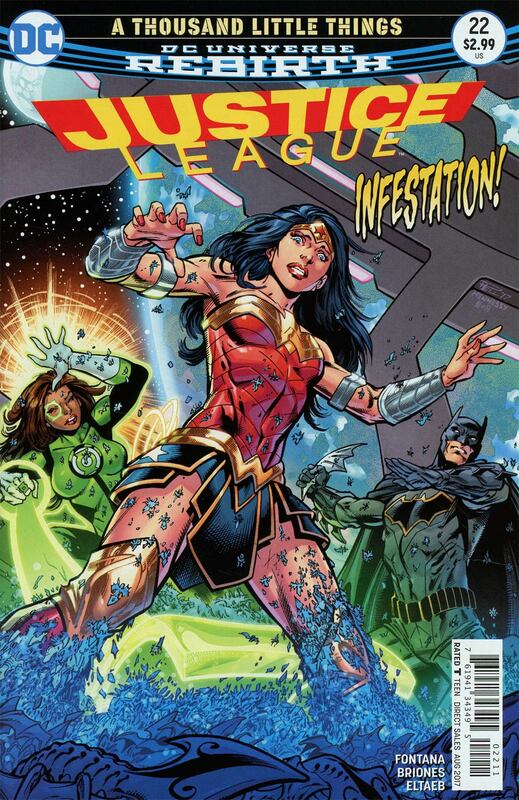 A quarantine follows, and the League learns that the queen of the species has attached itself to Jessica Cruz. The League finds a place for the creatures, and the day is won, again. The installment, while little more than padding, allows the Green Lanterns to take some of the spotlight, and give readers a better understanding of their character. Unfortunately, what is learned isn't very flattering or helpful. Neither of the two Lanterns belong on the team. They don't show the requisite skill, maturity, temperament, or confidence one would expect from a member of the League. Part of this is due to the choices made by the fill-in writer of this issue, who's approach to the Justice League is displaying them as stock characters. Batman won't give Baz a high five. Wonder Woman, who has been in Man's World for some time now, doesn't know what a high-five is. Cyborg is a talking computer. Superman is an all around nice guy who never goes anywhere without his wife, Lois Lane, and son, Jon Kent. 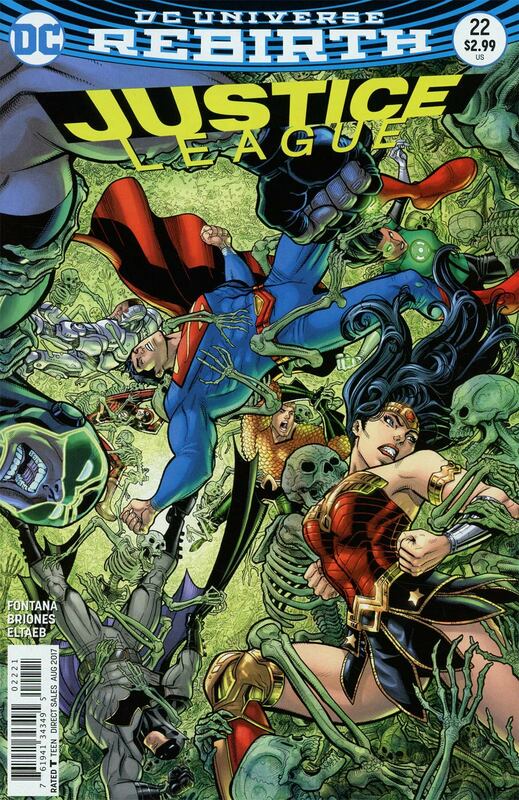 The results desired, if that, would have occurred if the rest of the League had maintained a rounded quality, as opposed to being cut-outs for the Lanterns to pose with. The most egregious instance is Wonder Woman going HAMM and hacking at the life-form, with no thought as to whether or not she would kill it. It was a teachable moment and it was botched, for no reason other than a lack of understanding of the characters. The modern comic book writer suffers on a number of levels, but it boils down to two main areas in which they are lacking: characterization and plotting. Few can do both well, as their approach to both is uninformed. Characterization is supposed to yield better understanding of the player in question, but most writer can only break a character down to build them up again. Plotting is even more scarce, as it's more challenging: the story that not only begins, but ends well... so most writers opt for character, however, the insecurities that Jessica Cruz displays here, were sorted out in the previous volume. The fact that they are returned to her once more, shows the difficulty in not only approaching the established character of the League members (Batman, Superman, Wonder Woman, etc. ), but even the nascent ones as well. Art - 3: A serviceable issue, but overall, lacking in dynamism. Cover Art - 3: A very bland offering.